Detached house, 10 people, 8 room/s, 5 bedroom/s, 3 bathroom/s, approximately 400 m², 3 floor/s. Please note: Groups with travellers all under the age of 21 on request only. Furnishing: comfortable, pleasing, well-kept, tiled floor, cotto floor, parquet floor. Equipment: satellite TV; stereo; internet access Wi-Fi (included); washing machine; gas central heating; air conditioning (only in the bedrooms). € 25 per person and stay (depending on occupancy). Electricity according to consumption approximately € 0.35/​kWh. Gas according to consumption approximately € 1.30/​cubic meter. Holiday resort tax. Linen/towels Bed linen, towels and pool towels available. Deposit € 600 or € 1200 per youth group (in cash). Extra bed sofa bed, 2x available, € 100 per person/​week (on order). Cot free of charge (on order). Pet 1 pet allowed (small pet only; please advise prior to arrival; additional animals on request only). 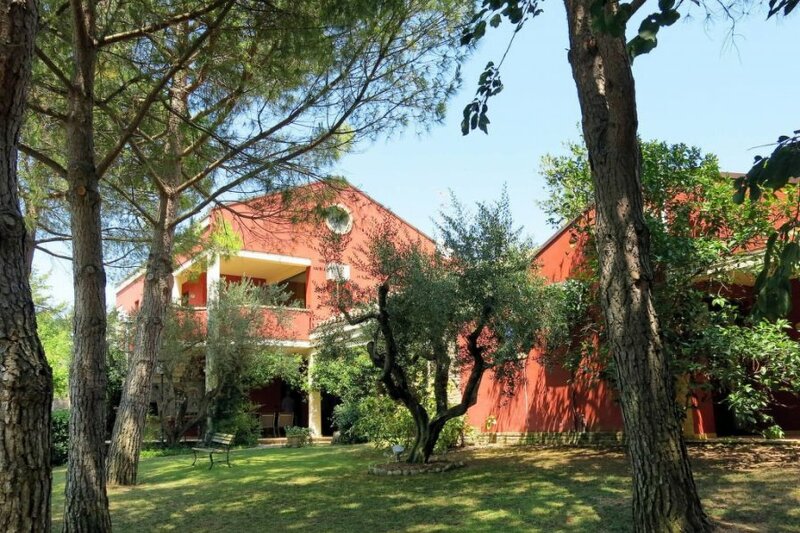 Estate (private use): approximately 2500 m², closed plot (fence, electric entrance gate), trees, with plants, park-like, well-kept, lawn. Garden maintenance by the owner 2 time/s per week. Outdoor facilities(private use): terrace 200 m² (roofed), furnishing provided, gas barbecue, external fireplace, pizza oven. Pool (private use): 10.0 x 5.0 m, 1.00 - 2.50 m deep, 13/04/19-26/10/19, pool maintenance by the owner. Pool area: tiled, sun loungers, sunshades, shower. Sports facilities/ leisure time: private use (free of charge): multi-purpose sports track, bowling/boccia, billiards, table tennis table (available during the whole season). The villa is described as good value for money. It has a private pool and is located in Spoltore. The nearest airport is only 8km away. It is set in a very convenient location, just 0 metres away from a beach and only 2.5km away from the city center. There is a golf course nearby. The villa is suitable for relaxing winter holidays.